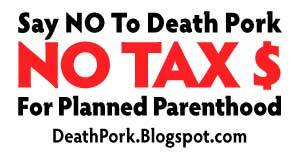 Say No to Death Pork: Tea Party Patriots Push for Defunding NPR - as Bad as Planned Parenthood? Tea Party Patriots Push for Defunding NPR - as Bad as Planned Parenthood? I received an email from Tea Party Patriots today, which declares their backing of efforts to defund NPR (and presumably the Corporation for Public Broadcasting). Does that mean they are about to put out a similar pronouncement about defunding Planned Parenthood? I have asked them and will let you know what I find out.